Georg Œhler curated and designed a show for Advantage Austria at the Milan Design Week 2016. The exhibition united 60 designers and brands at the famous Villa Necchi Campiglio. This a review in pictures. Tension Mirror by London-based Katharina Eisenköck combines a rough piece of marble with the fragility of a mirror held by a slim brass band. Pia Bauernberger showed coats that have been designed especially for design duo mischer'traxler. Robin Bensoussan alias Roben surprises with a finely worked Masque-pied - a shoe mask. A geomtetrical pattern unfolds to a golden wall lamp by ka ma interior. Furniture designed and/or made in Austria was presented together with re-edited designs by Friedrich Kiesler and a limited edition piece by Franz West, a coat rack named Sinnlos. The reference by West to Austrian philosopher Ludwig Wittgenstein reflects the motto of the show - Looking back, while moving ahead. The exhibition offered new perspectives of the design objects by allowing the visitors to use high precision telescopes by Swarovski Optik. The ATX scope system is a legend amongst bird watchers and also a truly stunning piece to discover for designers. A-Chair is a light new creation in wood by Thomas Feichtner. Ten telescopes invited the visitors to focus on details of the excellently crafted pieces. The time spent focusing, looking around and zooming in on the objects establish a different connection with the beholder. A combination of ceramics and brass handle makes a lot of sense for orchids to hold on to Mr Wong, a flower pot by eL Be Keramik. Simply by using a mobile phone camera the objects can be photogrpahed using the excellent quality of the telescope lenses. The light and the depth-of-field give a special air to the image and the vignette from the telescope delivers a sort of a lomographic filter automatically. A hydroponic system called Habitat by Jürgen Steineder is a prototype for a super sustainable life circle station for every home. A re-edition of Friedrich Kiesler Mergentime chair design by Austrian high-quality manufacturer Wittmann unites contemporary and tradition. A collaboration between Mads Perch and Georg Oehler resulted in a bar cabinet comibining crafts and arts. Alfonzo Conzeta created a circular wall light with layers, Eccentric for Austrian company Glass-Inspiration. Austrian specialist in solid wood Team 7 showed Sol, a work desk combining elegance with utility designed by Sebastian Desch. Cables and wiring for phone chargers and work stations are hidden cleverly in an elegant escritoire. Supertex showed Greenwall by Valentine Troi, a fully automated vertical garden for indoors. Leitner Leinen showed a woven fabric Friuli Art.256 sporting a pattern from a 18th century baroque chapel. The garden of Villa Necchi Campiglio is a stunning treasure in the heart of Milan. An outdoor kitchen for sophisticated adventurers by Camp Champ fitted perfectly for the understated elegance of the site. March Gut presented their colourful stools Leo. Without any doubt one of the main attractions of the venue is the peaceful garden in the heart of buzzing Milan. On the terrace by the pool Viteo showed a lounge chair from its Home Collection made of weather resistant larch wood. The outdoor lamp Zoe Solar is charged by sunlight during the day. Equilumen by mischer'traxler is an installation of two lights in a fragile balance. Visitors can move it and while it gets closer the light gets more intense on one side and decreases on the other. A poetic interplay unfolds between the lights and the beholder. In the lavish interiors of the Villa Necchi Campiglio young Austrian talent was on display. Katharina Eisenköck, David Tavcar and mischer'traxler were set in the context of the library and living space of the famous 19030's home designed by Piero Portaluppi. The architect Piero Portaluppi was at the top of his career when he created Villa Necchi Campiglio. Not only every detail, door handle and finish was custom made but he also implemented cutting-edge technology of the time. Heating system, sliding door mechanism and the first swimming pool in Italy made the villa not only an object for architeture history but to a superbly functional family home until 2001. This mixture of style and knowledge is reflected by the choice of objects on the second floor. Silhouette presented their new collection uniting colours with their signature frameless lightness - Titan Minimal Art Pulse. Ertl.Novak's crystal was grown in their own lab and while the exhibition was going on one crystal was grown live. Neue Wiener Werkstätte showed an elegant yet minimalistic chair called Vitoria by Thomas Feichtner. The Swarovski Optik telescopes allowed also a closer look at the incredible details of the museum run by FAI - Fondazione del ambiente Italiano. The design for the Villa by Portaluppi included china. Beside his design with a C for Campiglio a design by Gio Ponti for the family can be seen. Lobmeyr and Wiener Silber Manufactur both showcased new work by Ted Muehling. Lobmeyr also showed Crystal Jellies by Talia Radford - a reality enhancing optical wearable. David Tavcar showed a ceramic design Haus Scheu Honeypot using an element of Adolf Loos' architecture as an inspiration. Crystal Jellies from Viennese manufacturer Lobmeyr is a reality enhancing wearable designed by Talia Radford. Lobmeyr produce refined objects in glass since 1823 and are still seeking to be on the forefront of design innovation. Neue Wiener Werkstätte showed a new collection by Thomas Feichtner. The Vitoria collection unites minimalistic with elegant style. Neue Wiener Werkstätte melts tradition, craftsmanship and design into contemporary classic furniture. Nov24 showed rugs handmade by nomads in Iran. The patterns are fading and re-appearing in different colour combinations. The excellence of the refined details in Sunday Morning makes it a master piece of a tray. Designer Kai Merkert makes use of the stunning wood working skills to be found in Bregenz forest area in the West of Austria. Steckn is wardrobe simply suspended between floor and ceiling by Kai Merkert for his label Gretl. A hidden thread allows adjustment of the finely crafted object. Neudoerfler showed office chairs on the marble staircase of Piero Portaluppi. The staging of the 1930's villa works very well with the high-end cutting-edge industrial design. Maya Pindeus and Johanna Pichlbauer light installation A Play Of Dependencies used different connections and contacts in a way that two elements always have to work together. The metaphor is great for a work environment where a complex world of relations and collaborations is necessary to achieve a goal. The installation is presented on a table called Unit from Neudoerfler Office Systems designed by Kinzo. Christian Lutz showed his work I Felt Oak inspired by the traditional craft techniques of the Austrian Waldviertel. He was selected from student works entered by New Design University in St Pölten. Instead of chosing one student Georg Œhler from the works entered by TU Graz (Technical University Graz) he decided to show all of them as the quality of the works were more than convincing. The works were all focusing on joints in wood working. Back Ahead - New Austrian Design Perspectives was organised by Advantage Austria. Director of Creative Industries Reanne Leuning. Curator and Creative Director for the show was Georg Œhler. He was assisted by designer Rio Kobayashi. The team in Milan was headed by Trade Commissioner Dr Michael Berger and the team was led by Carmen Kröpfl. Special thanks go out to Lilly Panholzer and Andrés Fredes from Alldsgn for the graphic works, to Swarovski Optik for the excellent support and to the team of FAI at Villa Necchi Campiglio under Cristiana Barriati and Nino. The exhibition was amongst 16 shortlisted for the best installation of the Fuorisalone 2016. The selection was made by a jury from 1200 installations. Georg Oehler, Reanne Leuning, Rio Kobayashi. Back Ahead - New Austrian Design Perspectives was shortlisted for the Milano Design Award. The award is now in its sixth year and has become one of the most anticipated moments of Milan Design Week. Dedicated to the most interesting installations of the week, the award goes to a designer or team whose work combines design, performance, technology and entertainment. The jury looked out for fascinating creations that were much more than just installations; instead they were exciting experiences for anybody lucky enough to take a wander. Only 16 out of 1150 installations have been shortlisted. More than 10.000 visitors came to see the show at Villa Necchi Campiglio. The exhibition featured on the evening news feature and a 10-minute report across all German-speaking countries and many international publications. The concept was selected as one of the top 16 out of 1150 shows of the Fuorisalone. Milan Design Week is the biggest event worldwide for furniture and interior design. While the business world gathers at the fairground, the whole city is flooded with spectacular design installations and brand presentations. Georg Œhler created a concept for Austria during the Milan Design Week. 60 exhibitors were selected and presented under the motto “Back Ahead – New Austrian Design Perspectives”. High-precision telescopes offered close-up looks onto the design objects. The show took place at one of Milan’s most prestigious venues, the uber-sophisticated Villa Necchi-Campiglio. The venue is the number one amongst the Milanese venues for fashion and design events. The central theme of the exhibition is the interplay between perspectives that look back at Austrian design history and those that look ahead to the future development of the Austrian creative industry. The use of Swarovksi telescopes offfered the visitor a different view onto design objects. Austria’s exhibitions in Milan have always been distinguished by their high levels of quality, innovation and appeal. Georg Œhler has designed the show before in 2012 with his former design studio Pudelskern. Reanne Leuning, Director of Creative Industries for Advantage Austria says “the choice to commission Georg Œhler was his ability to combine creative thinking and create style with communication and story-telling skills. Rio Kobayashi is an excellent addition to his team”. The world-famous Villa Necchi Campiglio in Milan is the setting for the launch of the first object in a new series called Arts On Crafts. The series sets out ot bring furniture designers and artists together to work on one piece. Photographer Mads Perch and designer Georg Œhler united their work in a bar cabinet using oak, brass and printing technique. Arts On Crafts #1 is a piece that can open up completely and reveals a photographic artwork on the inside. As it unfolds a portrait of a lady with fiery red hair appears. A powerful brush stroke of white was applied during the photo session using paint on glass. Elaborate details combining oak wood and brass make up the canvas for the artwork. The print allows an overlay of the wooden grain and the image. Arts On Crafts #1 is a bar cabinet and is completed by tray sporting a portrait of a young man in a red jumper. Mads Perch and Georg Œhler met when they shared a studio in London. Over the years interdisciplinary thinking and exchange led to this first collaboration. The worlds of photography and fashion meet interior design and furniture making. “Collaboration outside your own industry is always a learning process. It is great to see how deep Mads dives into the personalities and details of his portraits,” says Georg Œhler. Mads Perch is a Danish-born London-based photographer. He graduated from London College of Fashion and works with a wide range of commercial, fashion, editorial and music clients. Mads photography encompasses clean, crisp, fresh and beautifully understated portraiture to more vivid imagery imbued with 'vibrancy, attitude and a healthy dose of colour'. His award-winning work is widely published and he contributed the cover of the Creative Review Photography Annual recently. Georg Œhler is an Austrian-born London-based designer. He graduated in architecture from Innsbruck University and works in interior design, furniture and lighting. His work combines design narratives with highest standards of craftsmanship. Natural material and lasting values are the main ingredients for his objects of subtle luxury. Georg Œhler is the curator of the Austrian design exhibition during the Milan Design Week. The show is being held at Villa Necchi Campiglio and will showcase about 60 exhibitors. Swarovski Optik telescopes will offer new perspectives of the objects and allow discovering the selected pieces in a new way. Georg Œhler was commissioned by the Austrian Federal Economic Chamber. After putting the show together before with his former partnership Pudelskern in 2012 at La Pelota this is the second time that he has been responsible for staging the Austrian design industry in Milan. For this edition he took Austrian-Japanese Designer Rio Kobayashi into his team. Tuesday 12 April 2016 10 a.m.-9 p.m.
Wednesday 13 April 2016 10 a.m.-6 p.m.
Thursday 14 April 2016 10 a.m.-11 p.m.
Friday 15 April 2016 10 a.m-9 p.m.
Saturday 16 April 2016 10 a.m.-9 p.m.
Sunday17 April 2016 10 a.m.-6 p.m.
6-7 p.m. – invitation only! 7-10 p.m. – invitation only! We are very happy to work on the Austrian design show in Milan. Milan is fun, also when there is no Salone. And we are very happy that our recommendation for the venue - Villa Necchi Campiglio - made the race. It is such a wonderful place. Villa Necchi Campiglio in Milan is an architectural gem by Piero Portaluppi. In the garden of Villa Necchi Campiglio we found a new friend - Arturo Martini's 'Il Dormiente'. Rio Kobayashi and Georg Oehler - you can't miss out on Bar Basso, sbagliato. Georg Œhler has been commissioned as Creative Director and Curator of the Austrian Show in Milan during the Design Week 2016. 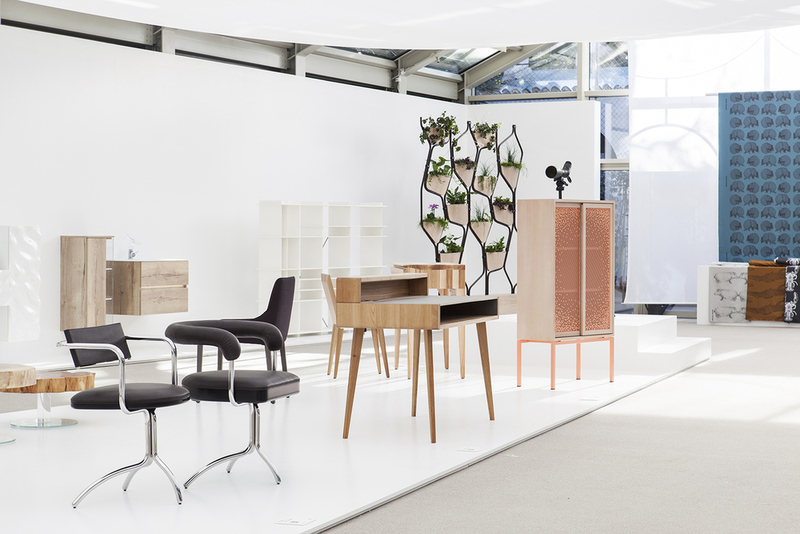 It is the seventh time that Austria organises a show for companies and designers working in the interior industry. Milan Design Week is the most important and prestigious event linked to the international design world. Milan counts 400,000 visitors from 160 countries, 1,200 events registered in the city, and 1,000 companies in the fair at the Milan Furniture Fair. For those Austrian designers and companies wishing to apply to exhibit follow this link Austrian Foreign Trade Creativity. Austrian-Japanese Designer Rio Kobayashi has joined the team. He is a gifted cabinet maker and has worked as designer since 2011. Clerkenwell Design Week was my first London show with a new collection. It was a great experience and the response to Æsh & Tweed was great. Here are some appearances in the press. Today's edition of The Times features a home story of 350 Degrees London.